Wow, look at the length of that bill! 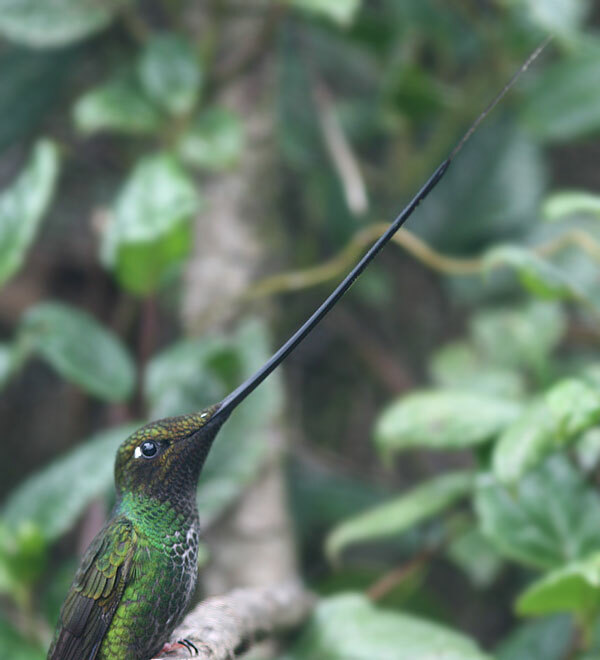 Allow me to introduce one of the coolest birds on the planet, the Sword-billed Hummingbird. 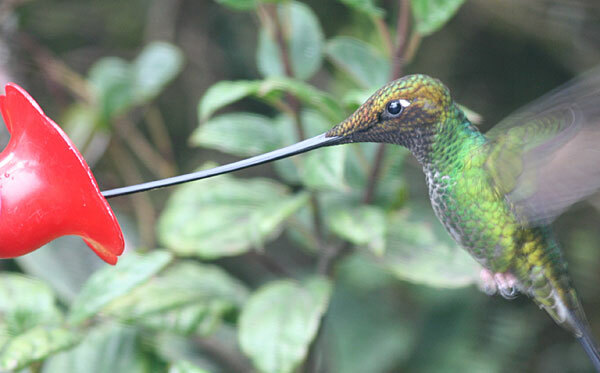 The Sword-billed Hummingbird (Ensifera ensifera) is a South American hummingbird found at high elevations (1700-3600m) in the Andes from Venezuela to Bolivia. This monotypic species stands apart from all other birds as the only one with a bill longer than its body. 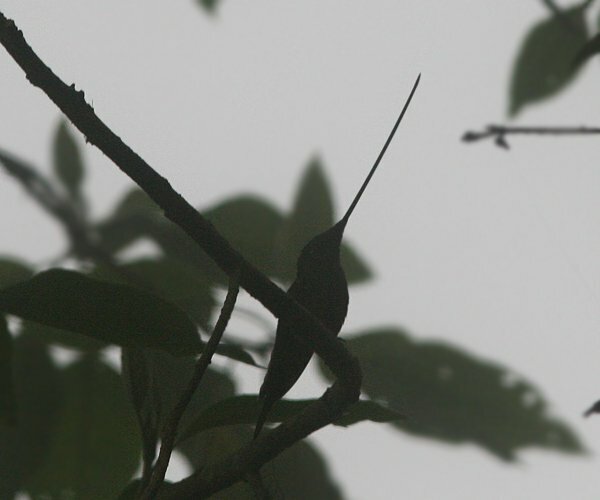 In fact, at 3-4 inches, the swordbill’s lengthy lance can be longer than some entire hummingbirds of other species. And it should go without saying that a bird with such a long bill will have an equally extensible tongue. Fire away! Many thanks to my friend Renato, owner and operator of Pululahua Hostal, for taking me to see these sweet sword-wielders (Latin derivation of ensifera) at Yanacocha Reserve and Guango Lodge. David was also with us when we encountered our first Sword-billed Hummingbirds; enjoy his entertaining and edifying gallery. 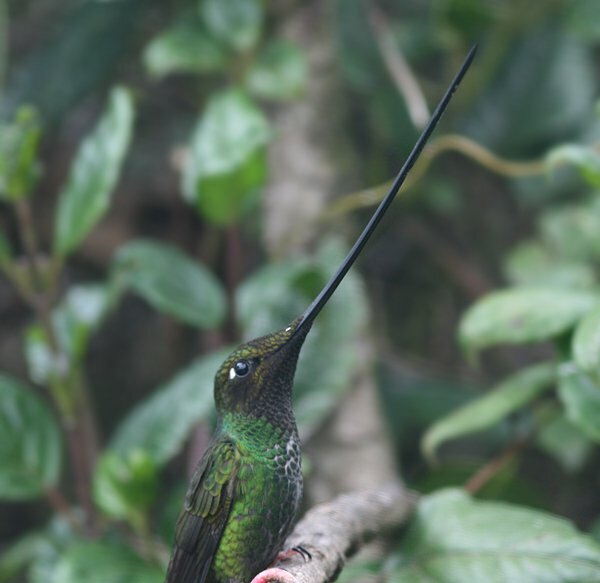 And for those of you who have fallen in love with this phenomenal bird but have no plans to visit South America any time soon, consider making your own origami Sword-billed Hummingbird! That is my favorite bird species. Mike, thanks for posting the photos. That’s one crazy looking hummer. And one I now have on my list to see. saw it in central Peru many years ago… amazing creatures! 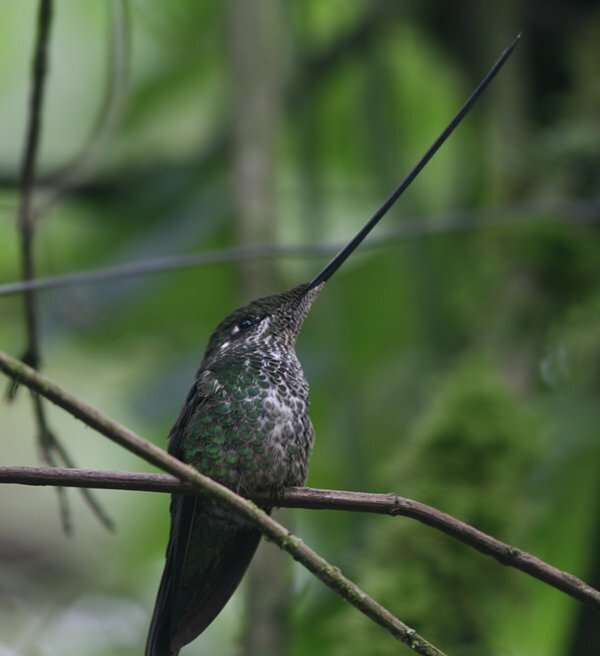 Can’t help thinking that less well endowed hummers might just bore a hole in the sides of the datura/fuchsia tubes and get at the nectar that way. Saves having to carry that tool around. joco, your excellent idea has already been instituted or rather evolved, but not by hummingbirds. Flowerpiercers like these two from Yanacocha use their notched bills to bore through blossoms to steal nectar. Isn’t nature amazing. Nothing like that over here. Thanks for sharing. Wow, that beak is just amazing. Very cool bird and photos. What an amazing bird. Long bills have to be difficult to work with. Great post and pictures. These are such special images. That such a bird evolved is the wonder of our planet. I remember hearing that Darwin predicted such a hummingbird or moth simply by taking into account the shape of an elongated orchid bloom he found in Madagascar. The moth he visualised was discovered 40 years after his death! Thank you for all you do and have done to make nature blogging so much fun. He’s incredible isn’t he?? Boom & Gary of the Vermilon River, Canada. These are beautiful photos of this amazing little hummer! I’ve watched our Ruby-throateds battle each other over feeding rights, and I wonder if this long bill is easily injured? Stunning. A beautiful set of images. Well done! Seriously? How come I’ve never seen photos of this thing before? That is insane. Where Are You Birding This First Weekend of July 2018?